Much of what this remarkable and steadfast artist has done in the past forty years stems from an intuition, very early in his working life, that something in the language of sculpture as it then was had to change, and that he had the wherewithal to change it. That wherewithal was a clarity of thought, and a pair of sturdy legs. 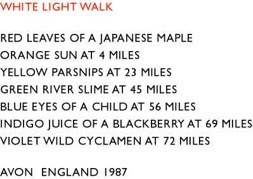 Richard Long has made walking the medium of his art. In 1964, when Long was eighteen years old and a student at the West of England College of Art in his hometown of Bristol, he went on a walk on the downs after a fresh fall of snow, making a snowball and rolling it along. When the snowball was too big to push any further, Long took a photograph of the track left by his trajectory. The action, ephemeral and recorded in a fairly artless image, was named Snowball Track (Bristol, 1964). It was a beginning. Three years later, for A Line Made by Walking (England 1967), Long caught a train out of Waterloo station, and when the suburbs gave way to the countryside, he got off the train and found a field. 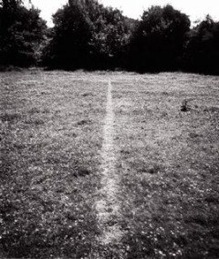 In it, he walked back and forth, until the grass flattened by his action became “visible as a line” in the sunlight. He then took a photograph of the line and caught a train back home. Of the many stories of the genesis of ideas and works by artists through the ages, this has to be one of the most striking, for it is both radical and deadpan. The choice of landscape was not symbolically significant: it had neither historic nor geological nor autobiographic resonance, nor did it have the kind of associations of the picturesque or sublime sought by ramblers of the romantic period. Rather, it served a practical, topographic purpose: it was sizeable, and flat. The action had about it a something meticulous and thoughtful, but was neither metaphysical nor personal. Here, then, was an embodiment, in the landscape itself, of Paul Klee’s definition of drawing as taking a line for a walk. And just as Klee had wanted to get back to the basics of painting (building up from point to line to plane to colour), so Long was to work through a series of limited abstract variables (lines, crosses, rectangles, squares, circles and spirals are more or less the sum of forms that he uses), as if the landscape were his canvas. Indeed, he has spoken of his work as “abstract art laid down on the real spaces of the world.” And here’s the twist: while the action in the landscape may be seen as the materialisation of a certain idea of drawing, the work that is given to us as viewers is essentially dematerialised. We have to take on trust Long’s action, and that trust is based on a mode of mechanical reproduction that, we presume, bears testimony to the event. So: as important as the gestures performed on the landscape was the photograph documenting the event. (Long’s is, arguably, an art that depends on the conceptual underpinnings of analogue rather than digital photography as a form of mechanical reproduction, photography that functions as witness – because it is the visible trace – of an event.) Each image was singular rather than serial, a metonymy for the action that it recorded, rather than the subjective testimony of a passage in time and space. Like the action whose visible track it captures, the photograph is emotionally detached. And if it inevitably incorporates, as all photographs cannot help but do, subjective variables – point of view, framing and so on – the considerations around the action of photographing the trace of an activity seem to be, at least at first viewing, documentary rather than aesthetic. Over the years that have passed since A Line Made by Walking, Long has made countless walks in the most diverse of landscapes: from Dartmoor, Devon and Cornwall, through Ireland, Switzerland and Canada, to Australia, Nepal, the Sahara or Iceland. Upon the countryside, he has lightly and unobtrusively left his mark, sculptures or drawings (depending on how one wants to see them) in a landscape figured or imagined as immemorial. 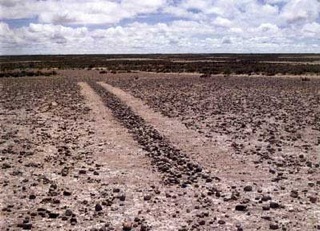 Stones rolled down the slope of a volcano, flat stones laid on a river bed, a walk in wet grass or tidal mud, the arrangement of limbs of timber or bleached shingles, a circle of boulders on the desert floor or of animal droppings on a tundra, the stamping of a track on shale or sand. The monument and the footprint are at either end of a continuum of human activity: the one symbolic, the other indexical. Where traditionally (though not in some contemporary art practice), the monument tends to permanence and operates by the logic of substitution, the index is a sign whose link to its referent is one of both contiguity and of pastness. An index, in other words, is the place where something else once was, the trace of it. The index is therefore pre-symbolic and has a direct origin. Without the foot, there is no footprint. Where the monument might commemorate and memorialise, say, singular actions of individuals, the footprint invariably bears witness to an individual presence that quickly tends to anonymity and erasure. Crucially, both monument and footprint are predicated upon absence. Between these two poles that designate a vacancy or void, Long’s work defines itself: always more ephemeral than one might imagine a monument to be, yet equally, more enduring than a footprint. In this respect, the art book or catalogue – that artefact that, with its deft juxtaposition of diverse images, André Malraux famously dubbed “the museum without walls” – has served Long well. It has played an important part in the preservation of his work. But more than a mnemonic of work accomplished elsewhere, the book/catalogue has also been one of the constituent parts of his work. The attention to graphics, layout and composition, the way the texts sit on the page like concrete poems and the photographs stretch between pages, all these details have been given the most minute and detailed consideration, transforming, as it were, footprint into monument. Long’s work is nothing if not consistent: a walk in a far-flung and rugged landscape still resides at the heart of most of his projects. Such distance brings to mind William Hazlitt’s aphorism that a wise traveller never despises his own country: Long as surely finds remoteness in England as abroad. If such consistency has led some to consider his working methods formulaic, one might respond with a two-pronged retort: first with a moralised argument about effort, rigour and tenacity, and then with a hedonistic exclamation about the sheer pleasure that the process patently gives him, renewed each time. He has, to an unusual degree, remained true to his initial proposition. Slowly, methodically, new (if always related) ideas have accrued and Long has broadened the scope of his actions, to the point that a project initially conceptual in nature (“I can draw a line by simply walking”) has become performative (“to what service can I put my walking?”). He has accumulated not only different forms of mark making in the landscape (spoor, impression, depression, rearrangement, addition, subtraction), but also different means of registering the event after the fact. Photographs are joined by text works, which he sees as “narratives of events and sculptures – walks – that I have made.” The word “narrative” is somewhat misleading: the texts seem more like verbal equivalents of walking, mimicking its clipped, regular pace. Pithy, elliptical, poetic in their brevity and associations, these texts are neatly printed on the walls of the spaces where art is exhibited, or on the pages of a book: “Dry walk: 113 walking miles/ between one shower of rain and the next”, or: “… the walk as a true path/ some false moves”, or “one new moon/ two thunderstorms / three places of standing stones…” They act both as descriptions of the compass of a project, and as flash-points of consciousness during a walk, annotating the many stimuli that flood his senses. Then, there are the materials brought in from the landscape and organised on the floors of museums and galleries: jagged flint from Norfolk, red slate and alpine basalt arranged in large, simple geometric shapes. In the enormous central gallery at the Tate, six such works may be seen. Hugging the ground, they command the entire space and oblige us to walk around them just as the topography of a terrain would force us to negotiate with its features. But while Long’s work seems to be all about tracks and traces, there is some evidence that he carefully expunges. 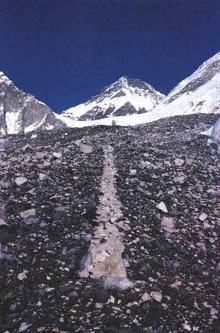 What form of organisation, what operations of logistics and transportation, are required to extract heavy rocks from a remote landscape and bring them into the museum? The photographs and text works never tell us. They are illusionistic in that they keep intact the fiction of artistic creation as somehow effortless. 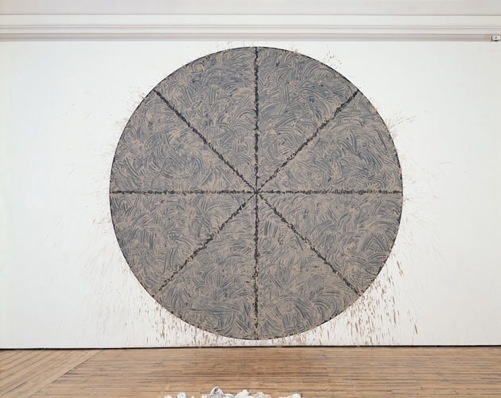 Finally, using nature’s own materials – materials that in themselves evoke a trajectory from landscape to museum (mud from the River Avon, clay from Vallauris, Cornish china clay) – the artist leaves his imprint in the space of the museum. Again, one is left curious as to the process of transportation, how the vast quantities of mud travel from countryside to art institution. Allied to the monumentality of scale of these pieces is the knowledge that at the end of the show, they will be erased, painted over. Here, rather than his feet marking the turf, we see that age-old, most primeval of all marks, the hand on the wall. But Long’s is less an autographic mark of presence (“I was here”) than the agitated track of a sequence of movements. These enormous, breathtakingly beautiful gestural wall paintings register the actions not only of his hands, but of the whole body powering those manual gestures. Looking at them, we are invited to envision the physical exertion that went into their making, just as looking at the photographs, we are enlisted to empathise with the duration of the walk, the strain and stretch of it. Contained within geometric bounds (rectangles, circles), yet filled with the splashes that track the velocity and fierceness of a kind of tactile and rhythmical dance, these are perhaps the most manifestly bodily of Long’s works. We may be reminded of Hans Namuth’s famous photographs, taken in 1950, of the painter Jackson Pollock dancing about the canvases he had laid on the floor in what art critic Harold Rosenberg dubbed “action painting.” But while Pollock’s work bolstered the notion of a dominant and empowered masculinity behind such acts, figured as those of a creative genius, Long’s wall pieces keep such connotations in check. They are at once more ordered and less emotive: painting becomes an equivalent, within the contained space of the museum or gallery, of very spirited walking. The body is everywhere implicit in Long’s work, for all of it tells us: someone was here. His is an art of traces and residues, an art that evokes the most intense corporeality. 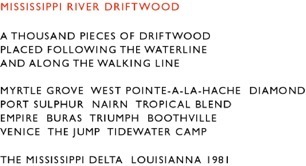 In it, the body is evoked as a fantastically disciplined instrument, an agent of immense exertion: covering a thousand and thirty miles over thirty three days in Cornwall, or placing a thousand pieces of driftwood “along the waterline and along the walking line” on the Mississippi Delta. 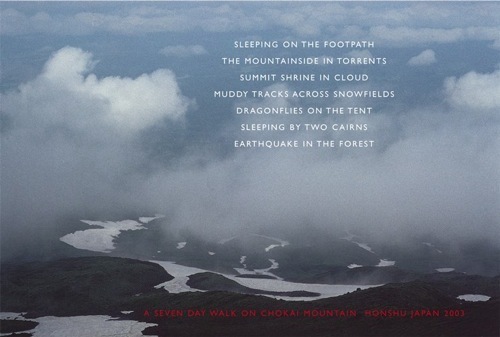 But the body is also there in the words that invoke all the senses that walking awakens: the warmth of a windless day, the roar of the river, “the split second chirrup of a skylark”, the splash of stones thrown into water, dragonflies on the tent. The tent itself, never pictured but mentioned in several of the text pieces, alerts us to the artist’s human (or perhaps creaturely) need for shelter, food, bodily functions: needs that would have had to be taken into consideration in the preparation for the journey. Along with a few vestiges of campfires, it is one of the sparse indices of a singular, embodied subjectivity, a particular person who is doing the walking. And that someone, however self effacing, is overwhelmingly present in the works not only as a body, but also as the sensibility that guides these specific explorations of the natural world. Long’s work did not erupt in a vacuum. It is framed by a carefully articulated discourse that situates his emergence as an artist at the crossroads of various artistic practices. It was born at a moment of ferment on both sides of the Atlantic, when the familiar idioms of sculpture and painting were overturned in diverse ways. The conceptual space into which his work – and that of many of his contemporaries in the 1960s – fits has been famously defined by Rosalind Krauss as an “expanded field” where the points architecture/non-architecture and landscape/non-landscape map out the terrain in which works are positioned in multiple and hybrid ways. 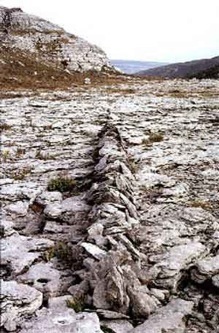 Long’s work is frequently linked to Land Art, to the earthworks for which, for example, American artist Robert Smithson was famous. 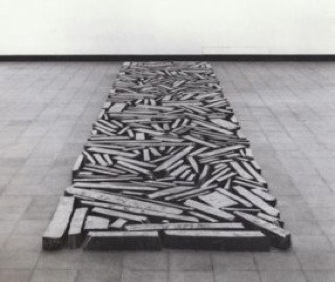 While these works similarly entailed an action in the landscape, they generally involved a greater sense of place and a far more pronounced monumentalism than Long’s work ever had: Smithson, Michael Heizer and Robert Morris moved tons of earth. For Long, there is no such literal site of laborious excavation, nor is the location where the action has taken place ever available to the viewer. Rather, the work exists as a non-site in a series of representational relays: in the overlap of maps, textual evocation, and photographic register. In this, Long’s early work intersected with conceptual art and its privileging of the photographic and the written document. But arguably, this work may also be seen as performance art in and of nature, but a performance that happens without an audience. 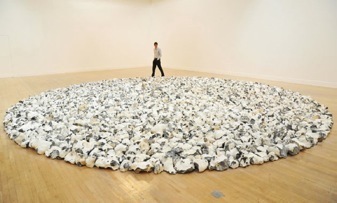 So: for each intersection with an artistic practice, Long’s work also contradicts that convention. 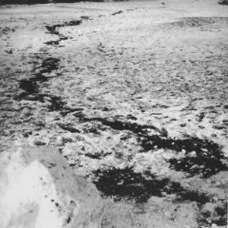 The formal elegance of his works in the landscape shares little with the more rugged ethos of American earthworks or the emotional, visceral “earth-body” performances in the landscape of an artist like Cuban born Ana Mendieta (b.1948, d. 1985). 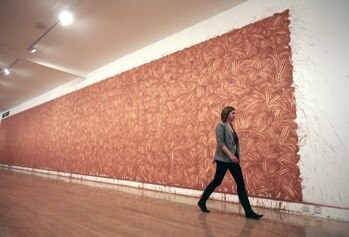 The poised grandeur of Long’s work as it is given to view in a museum or gallery strikes a different chord from the more intimate mysticism of Hamish Fulton, another walking artist, who was Long’s contemporary at St Martin’s School of Art, and who is the artist with whose work Long’s bears the closest apparent similarity. In effect, the austere elegance of Long’s work evinces an affinity with the aesthetics of minimalism. But it seems that to invoke any kind of aesthetics would be to incur a contradiction, if Long’s principles of working in and with nature were to be construed as working within the frameworks of either conceptual or performance art: art as idea or art as action (1). Then, it is also clear that while the very first photographs recording the trace of an otherwise invisible activity performed in the landscape may have been souvenirs or documents, Long soon realised the potential of the photograph to stand as a work of art in its own right. The refined aestheticism of his works puts him at odds, then, with conceptual, performance and land art. These ambiguities in the positioning of Long’s work within contemporary art discourses have, at times, served his detractors. But from the point of view of artistic practice, there is no reason why an artist should adhere to a single programme or defining manifesto. On the contrary, it seems to me that his refusal to do so has granted Long the freedom to explore that rather old fashioned concept of beauty, both from the point of view of the walker, and from the point of view of the artist. One might argue that beauty is not the point. 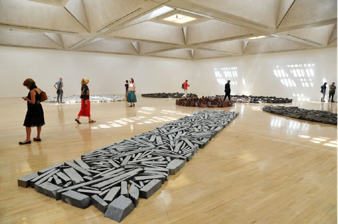 But perhaps inadvertently, Long sets us up to think that it is so, by the sense that every arrangement of stones on the gallery floor, every photographic composition, even the shape of every wall painting is not only grand, but also measured, poised. Then, there is the fact that the uninhabited landscapes in his photographs complies with a certain image we may have of an untouched yet photogenic wilderness, an image that increasingly, over recent years, has been sponsored by photographic representations we see elsewhere, in glossy travel books and colour supplements. Much work has been done, in the forty years since Long began his ambulatory art, to historicise and politicise concepts of wilderness. Scholarly and popular works alike have fostered an approach that sees landscape as a decipherable historical text, while many site-specific artists today focus on the cultural and ecological aspects of landscape representations. I have to confess to a feeling of relief that Long has paid little heed to the fashion for art-as-pontification. If I got even a whiff of po-faced environmentalism, or indeed of self-righteous identity politics from his work, I would lose the will to live. Long seems not to have been seduced – well, certainly not overtly – by a romance with songlines or a love affair with otherness via traces of ancient rites and customs, and the traces of Zennishness (which, I confess, slightly make me baulk) stem from a different source. From his texts and photographs, we would almost be led to believe that Long has crossed the most far-flung areas of this globe alone, without ever having stumbled upon an encampment or a village, almost never meeting another soul. One is left wondering about the reasons for the excision from his work of apparent traces of human presence . . . other than his own. The idea of the frontiersman is diametrically opposed to that of the self effacing walker, and it is to his credit and artistry that Long’s works hold these two images in delicate equipoise. All the more reason why the fleeting glimpses of the human and the civilisational in his work are so intriguing: in one photograph, two receding backpacks. 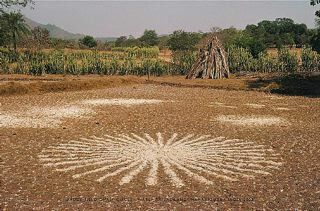 In India, at a distance, children stamping a circle in the ground, or a woman and two children passing on what, we are told, is “Warli tribal land.” Autobiographic marks are equally few and far between: a pair of boots, a kayak, a dip that marks a sleeping place… these provide uncommon visual disclosures of what it might take to negotiate the wild. 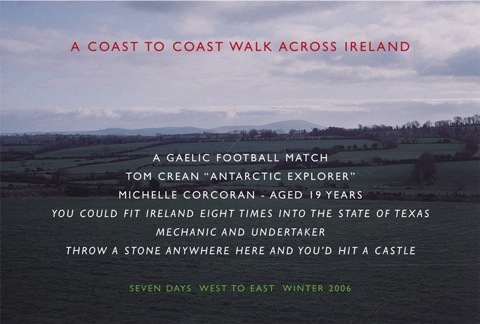 “You could fit Ireland eight times into the state of Texas”, in the piece A Coast to Coast Walk across Ireland (2006; see below) gives us an unexpected snippet of conversation. And in a rare and fascinating excursion into contextualisation, we are shown two photographs of Windmill Hill and the iron bridge at Coalbrookdale framing a small settlement of houses as the end points of a 113 mile walk in 1979. 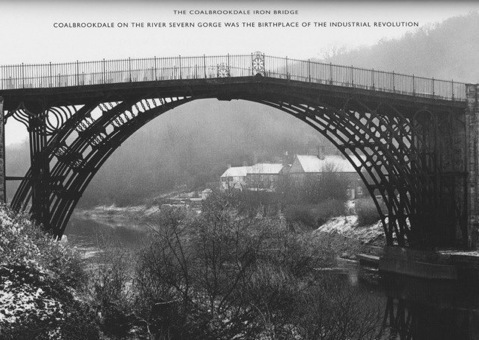 “Coalbrookdale on the River Severn Gorge was the birthplace of the Industrial Revolution,” we are exceptionally told (see below). Windmill Hill to Coalbrookdale, 1979 - the second of two photographs that constitute the work. Today, such solitude provides an image of a wilderness to which others – ramblers or more discerning tourists – might aspire. But the image of himself as a tourist is not one Long would wish to foster. Allowing us to see, if only momentarily, his awareness of the relationship between the solitary walker and the Industrial Revolution is a fascinating and, one hopes, self-conscious chink in Long’s armour. The attention he anomalously pays to industrialisation and its products (a bridge) suggests an awareness that artistic representations and industrialisation have enjoyed a mutually co-operative relationship, one from which the idea of tourism, and indeed of landscape itself, is never far. Even with the credit crunch upon us, the staggering expansion of the leisure and tourist industries has nurtured realisable dreams of holidays in remote places. If not many will venture too far from where public transport will leave them, growth in car ownership has meant that on the one hand, distance has closed in on us, and on the other, it has become increasingly harder to venture “off the beaten track,” except through intense effort, extreme arduousness. Clearly, in the ruggedness of his chosen territories, Long allies himself more with the explorer than with the tourist, but it is important to remember that his walks are always framed by an awareness of himself as an artist too. Even if he chooses to erase the traces of the real effort entailed in this enterprise, the photographs of nature slightly rearranged on stony or water-logged or icy country, the relationship between miles and hours, the breathtaking panoramas of pure extent, these all demand serious attention as unequivocally as they assure us of Richard Long’s own seriousness, whether the walker is wearing the skin of the artist, or vice versa. 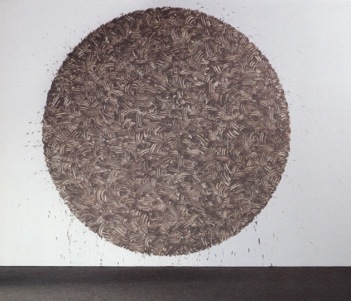 Haunch of Venison Circle, 2003 (River Avon mud on black paint. Diameter 445cm). Cara Aitchison, Nicola E. MacLeod, Stephen J. Shaw, Leisure and Tourism Landscapes: Social and Cultural Geographies, London: Routledge, 2000, p. 72. Ruth Rosengarten is an artist and art historian. She was born in Israel and spent twelve years in South Africa before moving to London and then Lisbon where she lived and worked for twenty years. Since 2002 she has been living near Stamford, Lincolnshire, U.K. The Painting of Modern Life: Contemporary Photography and the Everyday.